Take a look at these 6 Organic Fat Quarters! You have a chance to win a Dan Stiles for Birch Fabrics Mod Squad in Coral Bundle. Everyone has a chance to win, all you have to do is leave a comment on this post answering the question below and you will be entered to win. The giveaway will end at 2pm PST, Monday, April 16th. The winner will be chosen by random.org and announced later that day. Which is your favorite print from the new Mod Squad? Love the mod squad and coral stripe together-- very hip! Would love to win this fabric. Thanks! I like the stem stripe. i like the stem stripe too! They're all very cool but my favorite is the one that looks like flowers and leaves. Thanks for the chance to win. That's a hard one to pick! I think though my FAV would be the striped in coral, just love those colors!!! Thanks for the chance to win! I like the mod squad coral. stem stripe is my favorite! I'm sure I'm not alone when I say that Stem Stripe would be my favorite in this line! The Rally Cream is my fave; I actually used to have a little scooter, but we won't say how long ago that was! Just wanted to menion I'm on my mailing list for another chance to win the Mod Squad bundle! I'm always a sucker for fun scooter prints! Another fabulous collection by Dan Stiles! My favourite is the stem stripe. Thanks for the giveaway. I am on your mailing list. Wonderful giveaway. Thanks for a chance at some awesome fabric! I love to use stripes for binding, but the scooters are so cute! OH goodness!!! I love love love this!! Thanks for the chance to win! I'm a fan of the mod stripe. My fav is the coral stripe! Yum! I really like the stem stripe pattern. The coral line is gorgeous. Thanks. My favorite pint in this line is the Rally Cream/Coral. I receive the FabricWorm newsletter. A gorgeous giveaway to win..yes please. I subscribe to the newletter. The stem stripe is my fave!! I am on the mailing list. Love it! I like the print with the scooters on grey with plaid seets. 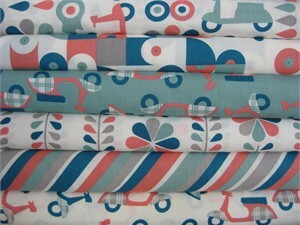 These fabrics are soooo cool! Love those motor scooters! Thanks for a great giveaway. OOOoooh how pretty! I love the Stem Stripe Coral so much! The rest are fab too! Very much liking the Mod Stripe Coral--adorable! My favorite is the stem stripe! Love the Mod Squad! Love the flower and leaves! Thanks for a chance. Eu gostei de scooters!são todos muito bonitos.Muito obrigado. Love the scooters on the teal! Too cute! Such a great color combination too! I'm on your mailing list already! The Stripe in the coral colorway would be perfect for a quilt binding. I like the Rally in Cream/Grass - cute scooters! I like the scooter with the plaid print. love the Rally print... so cute!! I like the stem stripe coral. So pretty! I like the Vinyl in grass. i like the rally pool/coral. Posted on FB but don't know how to tell you to get there to check. Oh gosh, each fabric is wonderful! I do really like the Rally Pool, the scooter print. The Stem Stripe is neat as well as the Vinyl and the Stripes. Can't just pick one. hehe. I posted on FB using your share button on the post. Thank you for a super giveaway and a chance to win some neat fabric. I'm loving the stripe! Already on the mailing list. Really hope I win, I NEED this fabric (I've already decided what I'd do with it)! Oh I also love the stem stripe. Rally Pool is my favourite - love the coral colourway. Beautiful colors. I love the stem stripe! I am already signed up for your newsletter!!!!! I really love those little italian Vesper scooters - reminds me of my first boyfriend in highschool!! I think my favourite would have to be the stripe. It would be perfect for quilt binding. The scooters of course! Thank you for the giveaway. Could you please give a tutorial on how to do the facebook thing? I can't make it work. Thanks. I like the Mod Stripe. Cute fabric! My favorite is the Mod Stripe! I love the rally pool/coral print! Thanks for the chance! I'll go with the stripes! I love the rally print in pool/coral. Ahhh-dorable!!! The stem stripe, coral, is my favorite, I think it would go with a lot of fabrics I have already. Thanks for the giveaway! I particularly love the Vinyl Coral. I'm on your mailing list already. I love the "Rally Cream/Coral"! Thanks for a fantastic giveaway! I like the Rally Cream/Coral!! I really like the stem stripe! Hi my favorite has to be the rally pool/grass. So cute! The candy stripe wins hands down. Bias binding anyone! I like the stem stripe! All so cute! But I think Rally Pool/Grass is my fav. Stem Stripe in Coral is my favourite (but I'm always a sucker for stripes!). Coral is such a great colour! And I get the newsletter I'm on the mailing list! Thanks for the extra chances! Man, I really love them all. But I think the Stem Stripe Coral print is my favorite. Closely followed by Rally in Pool/Grass. I think they are all great! The stem stripe is lovely! I joined the mailing list and posted the link on my Facebook page! Now, let's win some fab fabric! Love this fabric. Which one is not to like? I love them all! I'm already signed up on your mailing list. Rally! The scooters are awesome! I like the rally/pool grass best! The mod stripe coral is great! Reminds me of a summer candy cane! I like the rally in pool and coral. :) Super fun! The vinyl coral is too cool! I am all signed up for the mailing list! I like the Mod Stripes! Shared on facebook as Diana Z.
Pinned a bundle as Diana Z.
I think I like the stem stripe best, although those scooters are pretty darned cute. Stem Stripe Coral is my favorite! I love the stem stripe coral!